Actvity Summary: Students will be able to use their prior knowledge, plus the guides and materials provided, to catalogue and label one or more core samples. Upon recovery from the drill floor, each section of a core must be identified and catalogued. A detailed curation system was developed for identification purposes and to maintain the integrity of the core samples. Every piece of core retrieved from the ocean floor must be labeled and listed. It must also remain in the orientation in which it was formed. Once the core pieces are checked and verified, the core is cut lengthwise into two halves, the archive half and the working half. The archive half is kept intact, while the working half is used for sampling and testing purposes. Both halves are equally important and every possible effort is put forth to protect them. 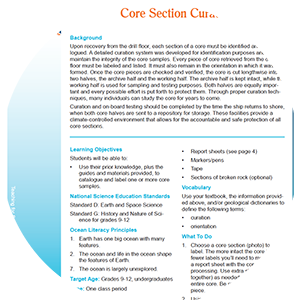 Through proper curation techniques, many individuals can study the core for years to come. Curation and on-board testing should be completed by the time the ship returns to shore, when both core halves are sent to a repository for storage. These facilities provide a climate-controlled environment that allows for the accountable and safe protection of all core sections.